Amy Arnold is a mother, a teacher, a writer, an administrator, a parent coach, and exhausted!!! She has worked with students with special needs since 1994, and specialized in autism and related disorders for the last 15 years, including parent coaching, sibling workshops, and sensory training. When not focused on education, she enjoys playing guitar and writing fiction. She can be contacted at amyarnold08@gmail.com. You are sitting at your desk after a long Thursday, drinking your cold coffee. No, it’s not iced coffee; it’s just left over from this morning. You open your email and your stomach turns over. 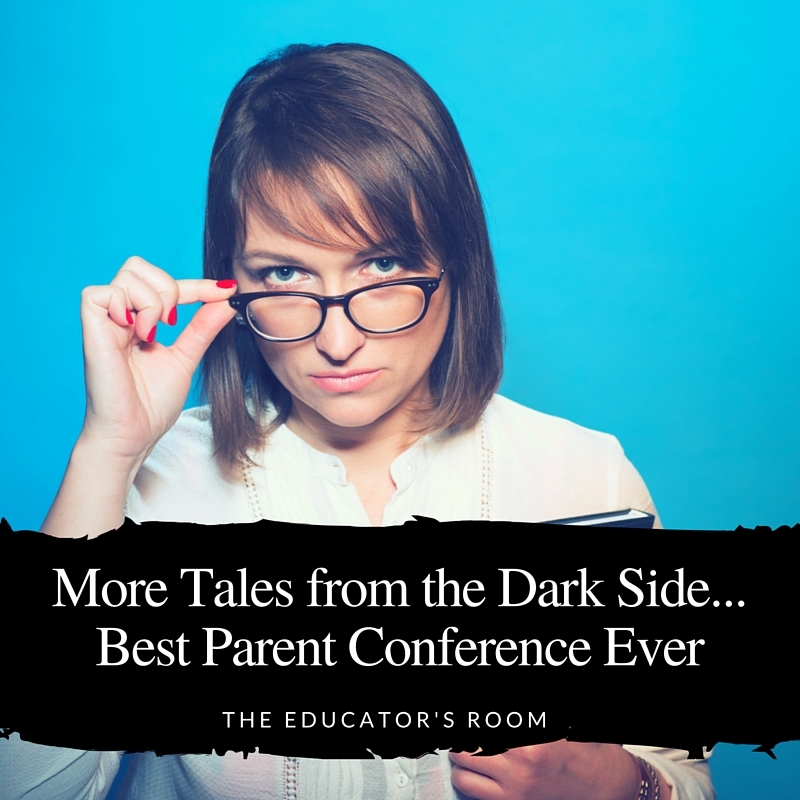 The subject line of the email says Parent Conference Scheduled, and it’s from your principal.” The email tells you that you should attend a conference with little Jackie’s mom and boyfriend next Monday, but please stop by her office this afternoon to discuss strategy. Why did she scheduled it? Why? Does this freak you out, or is it just me? The email came about Jackie, the sweetest little boy in my resource room. He only saw me for math, and he was making great strides! So I was surprised when the principal scheduled the meeting, and even more so that she wanted to meet in advance. But leave it to the Lunch Bunch to fill me in on what was really going on. The Lunch Bunch is that group in the teacher’s lounge that knows everyone and everything. So apparently, what I was missing was pretty juicy. -The Boyfriend, also known in the neighborhood as The Knife Wielding Biker, was well known in his community for riding around on his motorcycle and waving a VERY large knife over his head in a circular, and some felt, threatening fashion, which screaming obscenities at passersby and local residents. There was some discussion about whether it was actually a knife or a machete. Some thought it might be an axe, but the general consensus was a large hunting knife. -He had apparently been No-Trespassed by two other elementary schools in the district for bringing said knife on campus to pick up his stepchildren. He currently had a no trespass order at our school, as well. So since he had requested a conference with this order in place, we had to contact the local Sheriff’s office for officers to be present while he was on campus. -His claim was that the mother of my student, his own girlfriend, had such a low IQ that she was not legally capable of signing the IEP and he needed to be her representative. The principal notified the district of this issue, so they felt that it was important to send representatives from the ESE department to sit in on the meeting as well. -Turns out he knew a guy (who knew a guy, who knew a guy) that sued the school over something related to Special Ed. So clearly he was going to get rich by doing the same thing! This issue was also brought to the attention of the district, who felt it necessary to send a representative to address this issue, should it come up. Now we all know that this was a waste of our time. Seriously? But the principal and the district felt that we should address it head-on and document all these concerns for legality and posterity and all that jazz. So the conference was set for Monday. Friday afternoon, we even had a mock meeting where a male teacher pretended to be an angry parent and yelled out us while we practiced keeping a straight face. Seriously. This was the principal’s idea to get us ready for war. All weekend and all day Monday, my stomach churned. We were asked to present to the conference room 15 minutes before the conference was due to begin. The district representatives whispered and chatted, the principal and LEA quizzed me on my preparation of data and notes, the homeroom teacher looked like she had swallowed a frog, and everyone began to look a little sweaty and nervous. Enter The Knife Wielding Biker, escorted by two officers in uniform, guns on their hip, looking serious. The poor girlfriend, Jackie’s mom, who was as sweet as her son, was clearly intimidated by this guy. She came in and hid her smile behind her hand, hiding her lack of teeth. She was self-conscious, shy, and she probably did have a lower than average IQ, but no one should be made to feel intimidated, and she should never have been put in this situation. But, sadly, in they came. Biker came in with long strides, swinging his arms covered in skulls and snakes. He wore leather pants and a leather vest with a local biker’s gang emblem. He was clearly enjoying himself, creating such a gathering of people on his behalf and beamed his charming smile at the group. We were seated at a long table, the principal directly across from the Biker, head to head. She attempted to take control of the meeting by asking everyone to introduce themselves, but he interrupted and said he didn’t care about any of that. He wanted to talk to that teacher of Jackie’s. The police officers, who had positioned themselves on each side of the room, shuffled their feet and looked a little nervous at his outburst. I introduced myself and began my speech about Jackie’s progress. He allowed me to talk about the goals we had set, what goals had been met, and where we were going with the curriculum. He then complained that the boy didn’t get enough homework. I assured him that I could easily assign more if he felt that would help. Yawning, he turned back to the principal and mentioned his concern about the mother’s IQ and her ability to represent herself at the meetings. The district rep explained that since she had not been declared by the court as incompetent, that argument was shut down quickly. As he strutted out of the room, the deputy was still in his stance with his gun pulled. The mother grabbed her purse, looking stricken, and followed him out, apologizing profusely to all of us. The principal was still hiding behind the LEA. The district reps were getting up off the floor. The ESE specialist was weeping into her hands. When I was able to breathe again, I looked around at our motley crew of professionals and burst out laughing. Everyone looked at me like I had lost my mind! But slowly, they all began laughing, too, until the room was hysterical. Jackie HATED having so much math homework. His homework was rarely, if ever, completed. A photocopy of every homework log was placed in the principal’s box for the remainder of the year by me, and I kept another copy in my own file, just in case. And I transferred to another district for the following school year. It was hard to continue to respect a woman who ducked behind another one in the face of — a comb.